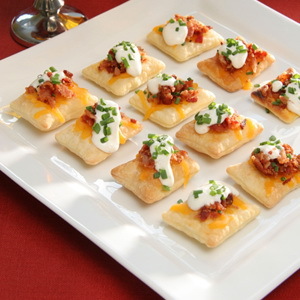 Your guests are sure to enjoy these bite-sized appetizers with big-sized flavors like bacon, Cheddar cheese, and a creamy ranch dressing. Unfold 1 pastry sheet on a lightly floured surface. Roll the pastry sheet into a 12x12-inch square. Cut into 36 (2-inch) squares. Prick the pastry squares with a fork. Repeat with the remaining pastry sheet, making 72 squares in all. Place the squares onto baking sheets. Bake for 8 minutes or until the pastries are golden brown. Using the back of a spoon, press down the centers of the hot pastries to make an indentation. 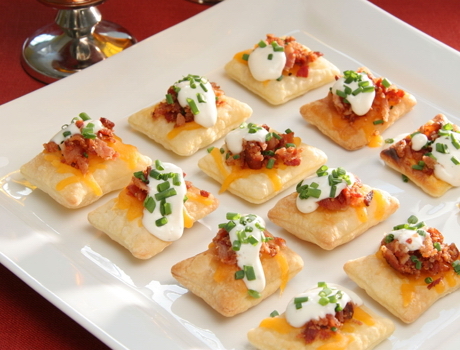 Spoon about 1/2 teaspoon each cheese and bacon onto each pastry. Bake for 5 minutes or until the cheese is melted. Remove the pastries from the baking sheets and let cool on wire racks for 10 minutes. Top with the dressing and chives.